Born in Italy, Lucio Agostini arrived in Montreal in 1915 and became a naturalized Canadian in 1926. His father, a composer and conductor, taught him musical theory. 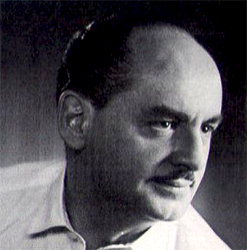 From 1932–43, he composed film music for the Associated Screen News newsreels and in 1934 he began working as a conductor for the Canadian Radio Broadcasting Commission (the forerunner to the CBC). In Toronto, where he moved in 1943, he composed and conducted the incidental music for drama series and variety programs on the CBC radio and television, and for over 20 years he held the position as conductor and arranger on the popular weekly series Front Page Challenge. As a composer, he wrote musicals, scores for movies (including a brief stint in Hollywood from 1955–56), shorts (many for the NFB’s Canada Carries On and The World in Action), concertos and an opera. He also recorded a number of albums with the Canadian Talent Library, and initiative of Standard Broadcasting. Agostini won the John Drainie Award from ACTRA in 1983 in recognition of his contributions to broadcasting in Canada.